Even on cold, blustery days, shoppers flock to the Montavilla Farmers Market’s ‘Winter Stock-up Market’. During the winter months, when visiting a Farmers Market for most is a distant memory, the volunteers behind the Montavilla Farmers Market set up a monthly “Winter Stock-up Market” to satisfy local shoppers. Note: Their last market is scheduled for February 10. In addition to winter crops, shoppers usually find many locally-prepared foods at these special markets. 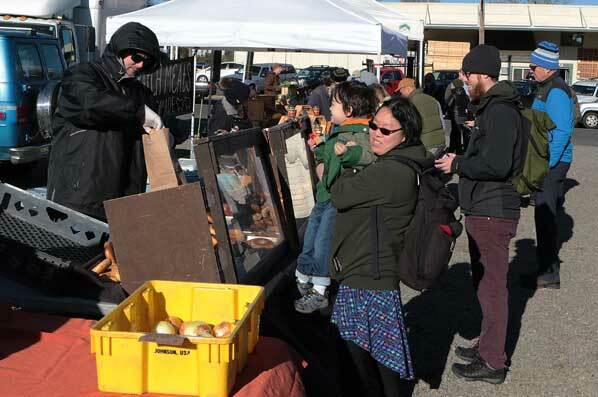 “I’m so glad they hold these monthly markets after their regular season has ended,” beamed Tabor East neighbor Kelly Sitzler, at the January 13 market. Rain, snow, wind or shine, these markets host 20 to 30 vendors offering winter and root crops, end-or-season fruits, and prepared and ready-to-eat food to the familiar summertime location. 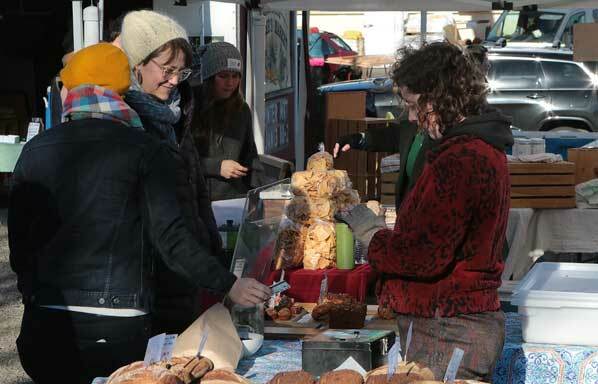 “It’s set up a little bit like a ‘truck market’, because we have fewer vendors; those who come can pull their trucks and trailers right into the lot, making it easier to set up and get out,” remarked Market Manger Amanda Cross. Michael Barron from Scratch Meats shows Market Manager Amanda Cross one of the several variety of freshly-made sausages he offers to visitors. 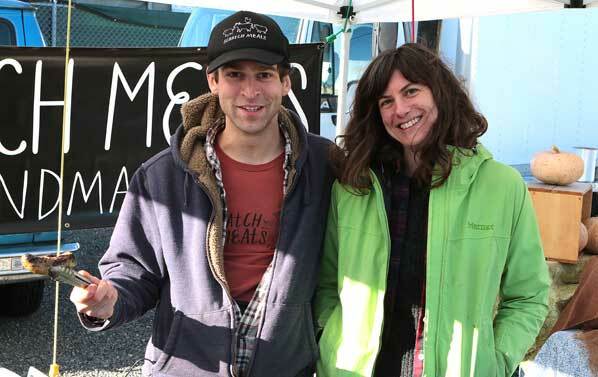 “People come out to the winter markets because they know the value of fresh food that’s grown locally, and produced right here,” Cross told East Portland News. “Food doesn’t taste any better than this, grown in Oregon! “And, our shoppers have learned that a lot of care goes into making our locally-made baked goods and prepared foods; people can really taste the difference,” Cross pointed out. 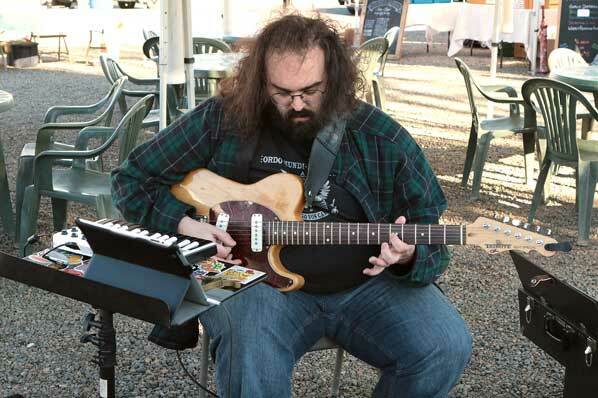 It’s not too cold for musician Jeffrey Shapiro of MilShap Music to share his tunes with shoppers during the market day in Montavilla. In addition, folks like the community experience the market provides during a time of year when most neighbors are shut up inside their homes, observed Cross. 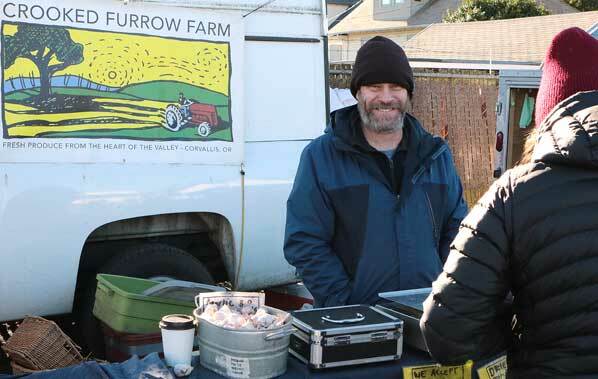 This happy vendor, Drew Mosher of Crooked Furrow Farm in Corvallis, says he loves these Montavilla Winter Stock-up Markets. Although the regular season is over, you’ll find one more full four-hour session, between 10:00 a.m. and 2:00 p.m., on February 10. It’s located in the 7600 Block of SE Stark Street, just west of the Academy Theater, and across the street from Mr. Plywood. For more information, to learn about volunteer opportunities, and to see their “Dog Friendly” policy, or just to look at the astounding variety of vendors there this week, see their website: CLICK HERE.